Red currants, as well as white and pink variety of this shrub has several distinctive characteristics and requirements for cultivation. To obtain good yields, it is necessary to adhere to certain rules of agricultural technology. For planting red currants suitable site with low groundwater levels – powerful root system of plants allows you to do this. This shrub can easily tolerate drought, but it is undesirable for a long period of stagnation vernal water or moisture after the summer rains, and the presence of cold winds. 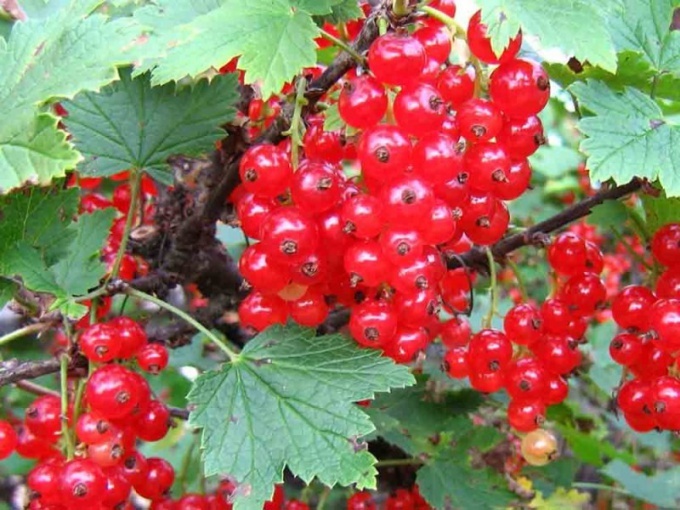 Therefore, it is possible to plant a red currant on all gentle slopes and flat areas, with the exception of the lowlands, and also for her to choose open Sunny areas, protected from the North winds. Planting red currant in the shade will be deprived of a green thumb most of the harvest. Red currants are tolerant of different soil types, but shows the highest productivity on acidic or neutral soils, fertilized loam and sandy loam plots. If the acidity of the soil increased (it grows horsetails, mosses, sedge, sorrel, plot before planting you need to proizvestkovat. It is permissible to use hydrated lime, dolomite flour or ground limestone. These minerals are directly in the planting hole. Planting currant can be carried out in early spring before the SAP flow, or fall, since the second half of September to early October. If the seedling is purchased in the store, you need to place it in cold water for 2-3 hours, this will allow the roots to make an additional supply of moisture in the tissues and will help to anchor the plant. Water can be added to a solution of Heteroauxin or Kornevina", in accordance with the instructions printed on the package. Dimensions of the landing pit must be 50x50 cm, depth - 60 cm Root system of red currant is more powerful than the other shrubs, and therefore requires a large area of supply. Each planting hole will need 2-3 buckets of compost, 200 g of superphosphate, 500 ml of wood ash. This nutrient mixture should be mixed with soil, pour in 2/3 of the planting hole and place in a mound on which to gently place the seedling. Then the roots need to fill the remaining primer and to seal the void. If you have bare soil, you need to pour the ground to the roots. On top of the plant it is necessary to properly shed water and mulch with dry peat. The branches of the sapling after planting it is necessary to cut 1/3 of their length to help anchor the plant. Before the onset of cold weather plants need to till the ground or to mulch a thick layer of humus or peat for protection from freezing. With the onset of spring, the bushes will have to ratkoceri. The growth of plants will be necessary to gradually change the old branch to the new foster shoots and thin out the Bush, without its shading. You should also cut diseased, damaged and weak branches. It is desirable to use sharp secateurs, branch to remove the "ring", i.e. not leaving the stump and slices obscure garden pitch, to avoid penetration into the wound of pathogens and pests. Twice in a season: after Bud break and harvest, the plants should be fed complete mineral or organic fertilizer is a positive impact on the quality and quantity of crop of berries.